For years I've known that the Canadian Pacific Railway's transcontinental line runs through some of the best scenery in the country along the North shore of Lake Superior. Unfortunately, there is no longer any passenger train service along the best part of the route. 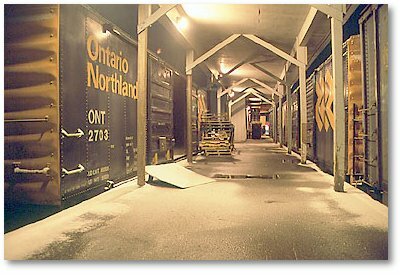 Since I was travelling to Thunder Bay anyway, I would have the perfect opportunity to try a long-haul freight-hop out of White River, Ontario, the end of the line for Via Rail's Lake Superior passenger train. (Maybe it would be more accurate to say that going to Thunder Bay was an excuse for a freight ride). I "took it easy" to Sudbury, Ontario, riding the well-priced (especially since it was a night bus and could double as a hotel) Greyhound. I somehow forgot my ten cent photocopied map of Sudbury, but on the way into town we went right by the train station. Things were working out well already. I had three hours to walk from the bus terminal back downtown to the Via depot, and it only took about an hour. I always seem to spend most of my travelling time waiting around. Rolling northwest out of Sudbury, there is a long climb up past the famous nickel mines. All the spots where molten metal is dumped are obvious, and the power lines from an old electric railway are still there. After Cartier (a crew change for freights), the tracks are long and straight, and the speed limit is sixty miles an hour. Generally the Budd car cruises at around 40-45 on the twisty single track. The area near Sudbury is some of the most scenic, and it generally becomes more monotonous towards Chapleau, and better again as the train continues westward. Along the trip to White River, it became obvious that this must be one of the most laid-back train rides left in North America. 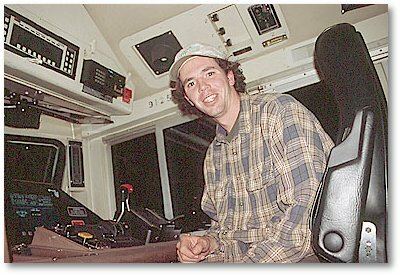 It's no problem to hang out with the crew up in the cab, and by doing this I learned an incredible amount about railway operation, as well as making friends with an engineer. He later provided some invaluable assistance in terms of helping me survive in White River, and getting a ride on a freight to Thunder Bay. Most of the passengers are locals, or hunters with a camp along the tracks. They get off along the way, so that by the time we got to White River, the two-car train was carrying three crew members, myself, and two other passengers. This train is definitely government-subsidized. The only reason it still runs is because of the remoteness of the route. 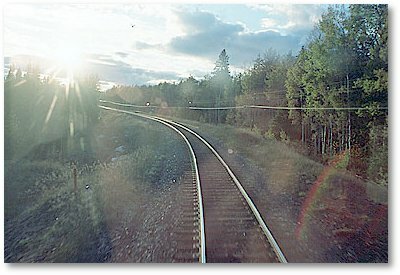 There is no highway parallel to the railway the way there is in a lot of other areas. For a lot of camps, and even a few small towns, rail is the only way in. Even Chapeau, although it does have road access, is pretty out of the way from anywhere. My impression of that town is that it is a very stereotypical (if not actually typical) northern community. It is full of small aluminum-siding houses and mobile homes. Most roads are not paved. Food is expensive. It does have an overpass though. We stopped there just long enough to refuel and run into the store for snacks. After refuelling (which means sitting beside a bunch of gas hoses along the rail line and waiting for a truck to show up with our gas - figure that one out), the Lake Superior changes crews and continues west to White River. I rode most of that distance in the cab with Jack [name changed], listening to rail stories, and seeing all the spots where there have been wrecks. There were plenty of stories of near misses between trains and people or vehicles. 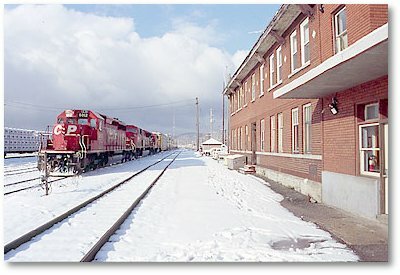 In White River, I stayed on the train after our two rail-buff passengers got off,and waited while Jack parked it, with the baggageman on the ground throwing switches. We then went into the crew lounge in the old station to check out westbound freight departures, and I was given a brief rundown on rail traffic control and the meanings of the numbers of trains. My best bet would be to ride with the crew of a 213 (mixed freight) that was scheduled to leave at ten the next morning. This would not be the hotshot that a 100 series train is, but it would get me to Thunder Bay during the daytime. Not to mention it was one of only four westbounds all day on Sunday. After printing me a copy of the schedule, Jack took me to the Green Gables Tavern for a couple beers, then let me back onto the Budd car where I could spend the night in comfort and warmth. This turned out to be a real bonus since it snowed about three inches overnight, and I didn't have a tent or any intention to stay in a motel. In the morning, I made a point of being at the station in time to catch the 213. When it hadn't shown up an hour after it was scheduled to leave, I assumed it must have left before I woke up (my timetable printout showed a 213 at around 2:00 am so there was reason to be confused). I went back to the warmth of the Budd car to wait for an update. I knew that the Lake Superior would be heading back east around noon, and that the crew had to turn it around first, so I could get some more advice from Jack. I should have known better than to think a train would ever leave ahead of schedule though. Sure enough, the 213 arrived in White River around the same time as Jack got to the Budd, but was rescheduled so it wouldn't be leaving until 4:00 pm. I hung out with the Via crew until they left for Sudbury, then waited around all day, mostly out in the cold, trying to get into the only restaurant in town (which was closed because the power was out), and later in the crew lounge at the station, waiting for the new 213 crew to show up. By four o'clock, there were a few crews around, but none were for the train I wanted, and none of them were going to let me ride with them anyway. Eventually a 105 intermodal pulled in, and I got permission to ride the head end with the engineer and conductor, at least as far as the next crew change, at Schreiber. I did have to do a bit of story telling to one of the other rails in the lounge who asked "Who are you". I'm Sloth... Van Bismarck [told him my real name though]. "Ya, but who are you". Jack had trained me for this, so I had a story ready: "I worked on the St. Lawrence and Hudson out of Peterborough". This brought an "Oh, I didn't know you worked on the railway" from one of the engineers who had denied me a ride earlier. And from the crew I would be riding with: "You can drive the train then!" When I was going through all the potential questions I might be asked, I wondered if this one might come up, so I had an answer ready: "I mostly just worked the two swing bridges in Peterborough". There's no way I was going to let myself get into the position of having to prove I can drive a train... I know my face was bright red when I said all that, but it seemed to satisfy the guys with the questions. I think the crew I rode with knew the truth, but were just as happy with what they heard. It was unfortunate that after all the trouble I went to in order to get on a train out of White River (the scenery being the main motive), the trip ended up being almost completely after dark. As we pulled out of the yard (passing the 213 that was still parked there), the sun was just setting, and a full moon was coming up in the east. This in itself provided a pretty unique perspective. Despite it being nighttime, the beauty of the scenery was obvious. As soon as the railway hits Heron Bay on Lake Superior, it follows the coastline most of the way to Thunder Bay. The headlights light up enough that the lake can be seen reaching out to the left like an ocean, as well as the cliffs rising to the right in all their massiveness. Some sections have slide detector fences that are supposed to stop trains whenever there is a rockfall. There are some tunnels, but none very long. To try and get some photos, I rode the front platform of the locomotive a couple times. The timing couldn't have been better the first time I opened the door - a bear was running down the tracks right in front of the train. I missed the photo, unfortunately, but luckily the train missed the bear too. 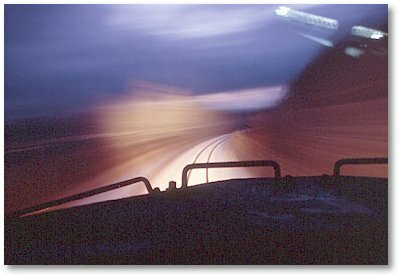 There is a surprising amount of skill involved in driving a train that is over a mile long. On grades as slight as 1%, locomotives are on maximum throttle, and even then they lose speed as they climb. On the downhills, dynamic brakes are usually used, but since they didn't seem to work on our engine (they set off a screeching alarm that I later had to put up with for about five minutes straight), we relied on airbrakes. The ride to Schreiber (the next crew change) was an interesting one - I continued my intense education on railroad operation, and heard more stories from the crew. The highlight had to be when the conductor (a man even younger than twenty-three-year-old me) set me up in the third unit for the ride from Schreiber to Thunder Bay. Since he didn't know if the next crew would be cool with a rider, it seemed like the best thing to do would be to hide me. So, while cruising at about forty miles an hour, we set out along the side running boards of the units, to the backwards-facing third locomotive. That's a rush in the dark, even with a flashlight. Imagine what people would think if they saw a train go by with people walking along the outside. It had to be the third unit, though, because the heater didn't work in the second one (wouldn't want to have to wear more than a T-shirt, right? I would have literally frozen to death if I had tried to ride a freight car as originally planned). As we slowed for Schreiber, I kept out of sight. When the train stopped and the dynamic brake alarm came back on, I assumed the worst - maybe it had been going for the whole trip in this unit - and popped in some earplugs. After a few minutes it shut off, and after waiting a few more minutes just in case (the siren had been shutting off for a few seconds then starting right back up), I finally took the earplugs out. And this is unbelievable - at that exact instant the siren came back on, stayed on for the split second that the plugs were out, and shut off again as soon as they were back in my ears. A crew member came back to check some dials - probably the earlier crew told him I was there after all. He asked a couple questions: Did I work for the railway, and did I talk to anybody about riding. In keeping with the understanding that "nobody saw me", I told this new operator that I hadn't spoken to anybody. I think that even if he knew I had ridden with the earlier crew, he appreciated the aspect of confidentiality in that I didn't betray the previous crew as a precedent for staying on the train. Safely en route it was time to explore my surroundings. It was possible that the crew might come back again to check on me again, but not too likely. The best seat at least ensured that I would not be surprised if someone showed up - by sitting in the engineer's seat I could see along the running board and down the tracks ahead of the train in the rear-view mirror (remember the engine is facing backwards). With the heat cranked, I could leave the window wide open, and lean out for a look whenever something interesting came up. It also gave me a chance to study the computers, which were mostly useful for knowing the speed, but also interesting in that they showed everything else the engineer was doing up front. Because I was sitting backwards with the windshield facing the freight cars, I got a great view of the twenty-foot vertical steel wall that is the end of a triple level auto carrier. Generally not too exciting. Definitely not as interesting as it would have been to look out over a string of flatcars carrying British army vehicles, like what was on an eastbound train we met. Of course I would never be allowed on that though - the Brits send their own security people in cabooses in the middle and the tail end. But I did get to know a tall steel wall pretty well. This was more intriguing than it sounds, though. Soon after getting into the engineer's seat, I noticed what looked like car taillights flashing inside the auto carrier. It happened a few times, always in sets of three flashes. Of course there's no way that the car lights could flash, unless there was somebody in there... This really started to bother me - I started off being convinced that there was somebody in there flashing the lights randomly as an SOS, then decided that in reality it had to be some kind of reflection from passing lights. By the time I had got to Thunder Bay, though, I was positive that there were lights flashing inside that freight car. I will never know the cause or reason, but I hope there wasn't a person in there. The only explanation that I think is even remotely plausible is that the car alarm was going off from vibrations. I was actually so convinced at one point that there was somebody in there, though, that I tried to get a response from the "person". This became a bit of a moral dilemma - being an illegal rider it would have been very difficult for me to have the situation checked out without incriminating myself. As a human, though, I should definitely have sacrificed my secret ride for another person's life, which is why I started using hand signals and flashing the interior lights of the engine in an effort to get the "person" in the car to flash five times instead of three. This never did happen, but if it had, I would have been absolutely morally obliged to get that freight car opened, at all cost. As it was, I did nothing. The best thing might have been to make an anonymous phone call to the bulls, saying I saw a lights flashing on the train from beside the tracks. It was a little disturbing, but basically out of my hands, so I didn't dwell on it long after I got off. I let myself doze off a little as we rolled into Thunder Bay. Waking up in Port Arthur, within spitting distance of where I had to go, it was obvious the train was still moving too fast to jump off. By the time it was down to about thirteen miles an hour, though, it was in the heart of Fort William, the "bad" half of Thunder Bay, which I had been warned to avoid at night. There was not a lot of choice though - we were skirting the edges of some serious freight yards and only moving further away from Port Arthur - I had to get off. This was my fastest rolling jump off a train (I know some of you would probably jump at 30 mph, but I'm not that experienced), and it was basically onto another set of tracks. One of Jack's invaluable pieces of advice was helpful here though - put your back foot down first. It pulls your next step away from the train instead of under it. This only really applies for climbing down ladders, and might not work at high speed, but it is surprisingly easy at less than running speed. So I arrived safe and sound in Thunder Bay by cushions and by what I will call freight-cushions. What an intensely satisfying feeling it was to walk out to the main road with my pack on, and have my train still rolling by a few minutes later. It was four in the morning, and I set out on my ninety minute walk to the friend's house that I was to visit for the week, somewhat apprehensive about the shady neighbourhood, but not all that worried after all the good fortune that I had received over the previous couple of days. On the way home I hitchhiked from Thunder Bay to Cochrane, Ontario (an adventure in itself), then spent the night in a box car (where I took the photo above), before catching the Northlander back to Washago in the morning, and hitching home to Peterborough. Sudbury is not a Crew Change, but trains are limited to 10 mph when they cross Elm Street (downtown). MacTier is the first CC to the east of Sudbury. Supposedly, there are few, if any, bulls in these small towns, but Thunder Bay has some, at least on weekdays. Rails will pull you off a train, but they might leave you alone if you're in a unit. There's not much traffic (at least going west) on Sunday or Monday. Try to ride during the day. This is probably one of Canada's most scenic rail lines.